Personal Watercrafts, also known as water scooters, are compact water vehicles used mostly for leisure and entertainment related activities. Most PWCs can carry 1-3 individuals, and as opposed to being within the craft, the riders either sit or stand on top of them. The engine is located inboard which works with a pump jet that creates the thrust for steering and movement. 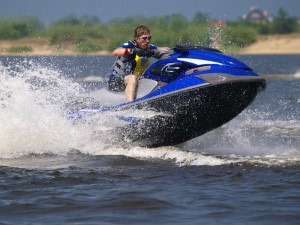 The personal watercraft, as we know it today, was created in Europe in the mid-1950s. While different prototypes were initially created, it was post the late 1960s that leading companies forayed into this area. Bombardier made its first water scooter in late 60s, followed by Kawasaki in 1973 - credited with mass-producing the popular stand up versions in use even today. Some of the leading models of water scooters are Jet Skis by Kawasaki, Sea Doo by Bombardier, Wave Runner by Yamaha and Sea Lion by Polaris. Due to their characteristics, water scooters are very versatile. They are compact and small, which makes them swift and easy to navigate and maneuver. With speeds exceeding 65 mph, water scooters are fast and agile on water. Their internally housed propulsion systems ensure the safety of water creatures and humans that might be caught in the wake. Their features make them good choices for both recreational and non-recreational uses. While you will find personal watercrafts in abundance at resorts, beaches and other recreational places, they are also used for more practical applications. Law enforcement agencies and lifeguards both use water scooters because of their agility. They’re extremely useful in search and rescue missions where lifeguards use water scooters specially equipped to accommodate safety and other medical gear to help save people in dire situations. Law enforcement agencies like the Coast Guard and police personnel use them to ensure law and order is maintained on rivers, seas and lakes.